Berkeley, CA â€“ 15 September 2011 â€“ This December, THE LAST BATTLE will arrive in the form of a gritty story of Caesar’s war against the barbarian armies of Gaul. Writer Tito Faraci (Diabolik, Spider-Man: The Secret of Glass, Daredevil and Captain America) and artist Dan Brereton (NOCTURNALS, The Punisher, God-Sized Thor, Red Sonja,Thrillkiller) created this complete and unflinching tale of one of the unsung heros of Caesar’s Legions. 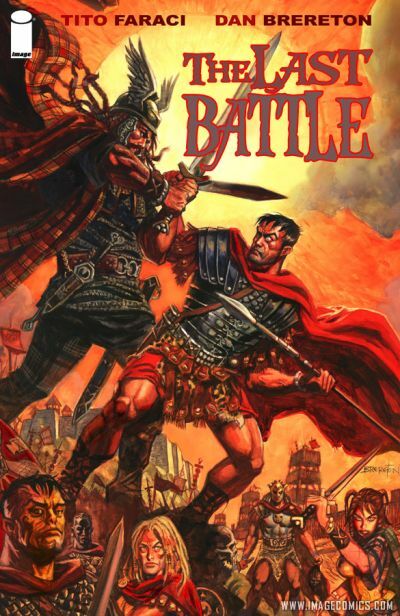 THE LAST BATTLE has been translated in many languages, and found great success in Italy, Germany, Spain, Brazil and more, but has not yet been available in English. Image Comics is now proud to introduce THE LAST BATTLE to American readers. THE LAST BATTLE, set in 52 BCE Gaul, begins as Caesar’s forces lay siege to the barbarian stronghold of Alesia in a battle which would forever change history; while the rebel Cammius, who once fought for Rome, leads a second barbarian army to attack the combined Legions of Rome from behind. Caesar dispatches his favorite general, Caius Rodius, to track through the untamed countryside, and bring back the rebel’s head. Who better to hunt Cammius, than the man who taught him the very skills he now uses to defy Rome? Tasked by a power-hungry leader he no longer trusts, to murder the man he raised as a son, Rodius questions whether the Roman â“road of stone and bloodâ€ is a path he still wants to follow. THE LAST BATTLE, an 80-page full-color graphic novel of intense historic war fiction for $7.99, will be on sale in stores December 21, and will be available for order in the upcoming November issue of Previews.